DSI offers a variety of Tools to assist in the deployment and management of DSI products. ATML Pad is a visual editor for the Automatic Test Markup Language (ATML). ATML Pad accepts and converts the eXpress DiagML format to ATML allowing for application specific editing of eXpress diagnostic designs. The ATML formats are versatile but complex. Direct editing in XML is next to impossible, even with capable XML editors. ATML Pad overcomes this problem by exposing an application-specific visual interface. ATML Pad manages the complexity of the ATML formats, allowing you to focus on describing your tests. It abstracts XML ID references, allowing you to simply select the referenced item from a list. In addition, ATML Pad can generate XML IDs automatically and ensures that IDs remain unique while you edit the data. 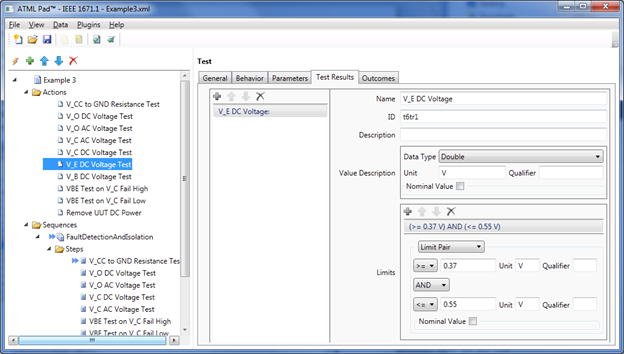 ATML Pad allows you to quickly generate complex ATML constructs through a single mouse click. It validates your data during input and on-demand, ensuring that valid ATML documents are produced. ATML Pad interoperates with the NI TestStand ATML Toolkit to deliver automatic code generation solutions that reduce the cost of implementing NI TestStand test programs and ensures their cost-effective long-term maintainability. Diagnostic Markup Language (DiagML) is widely used across industry to provide the most effective means to share diagnostic data and information between applications and databases. Providing a comprehensive interoperable diagnostic data exchange schema which can be customized to meet project / program requirements while supporting a collaborative concurrent work environment.